Delicious Gluten Free Cake– It’s Easier than you think! Glad you’re here for my first ever Blog post for Adorn Cakes! My Hubby wanted me to name this post “Free To Be Gluten Free”. I didn’t actually grow up with that program in school, so that title doesn’t amuse me. Anyway, we have an agreement that he is to be funny at work only. Right, Babe? The shock and amazement of my clients at the taste and texture of this cake leads me to believe that there’s not enough delicious gluten free cake out there in the world. And that’s what I’m all about: Spreading the gospel of good cake! 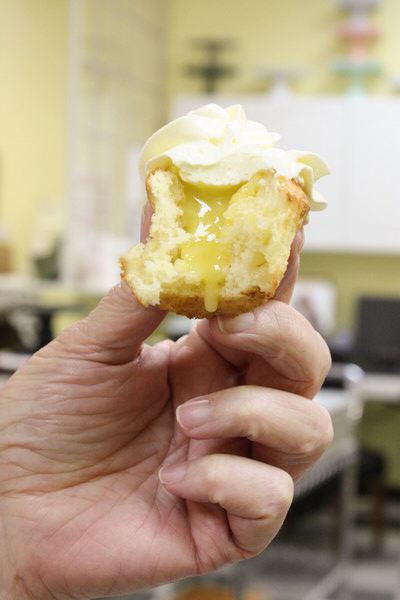 I don’t claim to be a gluten free expert–I AM an expert at baking cakes that taste Ah-MAZE-ing. Way too much effort goes into the decorating of a wedding cake for it to be anything but extraordinary on the inside. If someone has an extreme sensitivity/allergy to gluten, they require separate baking pans, and vanilla that doesn’t contain grain alcohol. It’s best to refer these clients to a gluten free bakery. I can recommend one if you live in the KC area. Don’t use substitutions for ingredients other than wheat flour. “If we can do without gluten, we can do without butter, or eggs,” –hold on there, sister!! Non negotiable. Use real butter, buttermilk, eggs, etc. A cake is only as good as its’ ingredients! Not all GF flour is created equal. To get close to the texture of a cake made with cake flour or all purpose flour you need a very powdery, non-gritty flour. Based on my research (and test baking) I recommend Thai rice flour from an Asian market. Thai rice flour was strongly suggested by a few experienced GF bakers. So don’t pick up the Bob’s Red Mill brand of flours when you’re at the health food section of your grocery store, (I already tried it so you don’t have to!) but you CAN use that brand of Xanthan Gum. 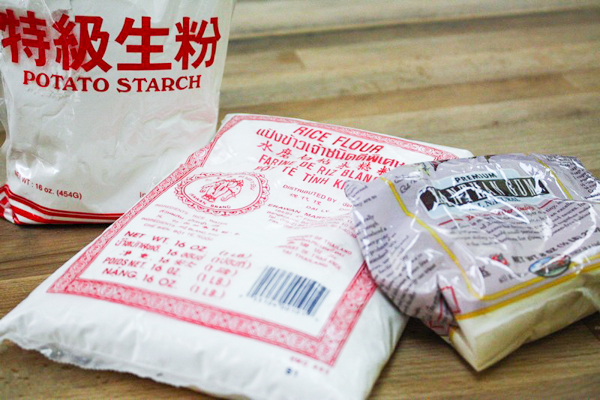 And while you’re at the Asian market, pick up some potato starch as well. 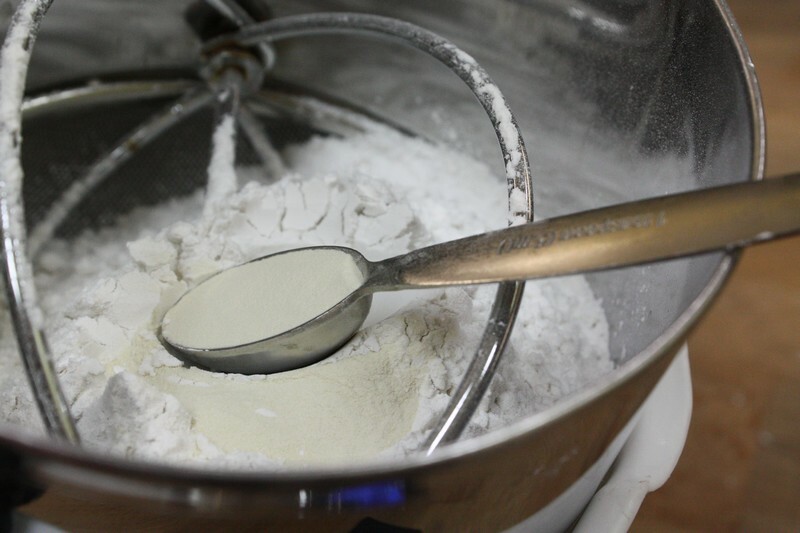 The more you mix the Xanthan Gum, the stickier the batter becomes, to the point of making it very difficult to spread in the pan, so I like to add the flour mixture at the very end and mix just until combined. I prefer to measure by weight, but the measurements are also given by volume. 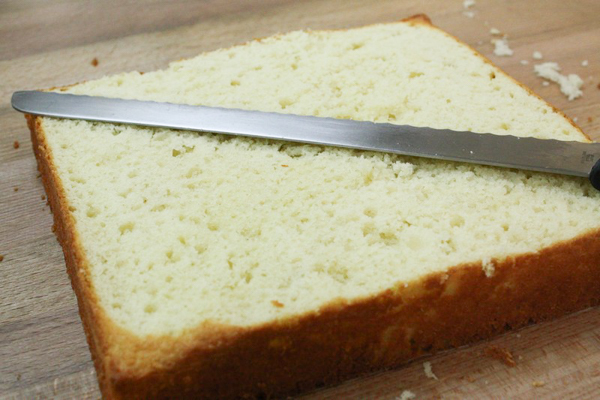 The recipe below is adapted from the Moist Yellow Cake recipe in Toba Garrett’s The Well-Decorated Cake, one of my favorite recipe resources. Preheat oven to 350°F (175°C). 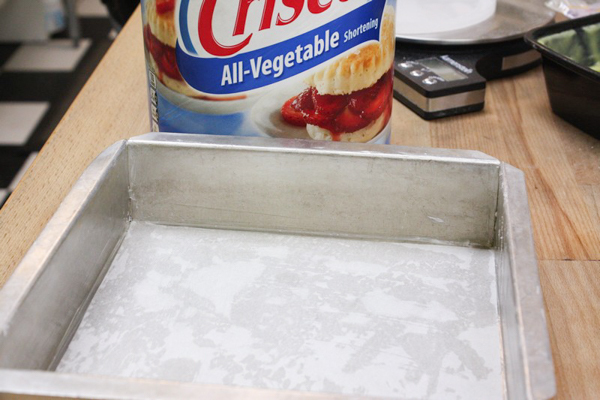 Grease three 8 inch or two 9 inch round pans with butter or shortening and line with parchment paper. In a separate bowl, sift together rice flour, potato starch, xanthan gum, baking powder, and salt. 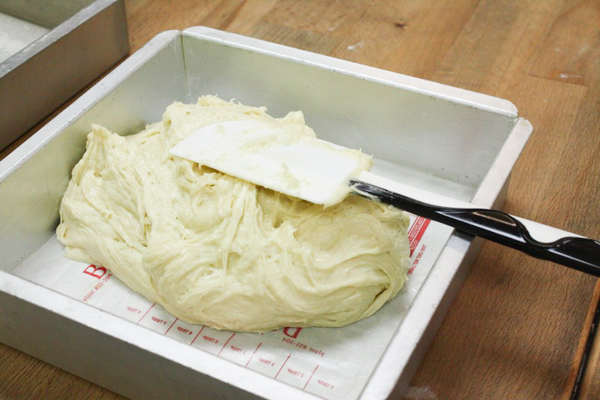 Using an electric mixer with paddle attachment, cream butter and sugar together until light in color and texture (about 3 minutes) at Medium High speed. Scrape sides of bowl and paddle and cream for an additional 1 minute. Reduce speed to low. 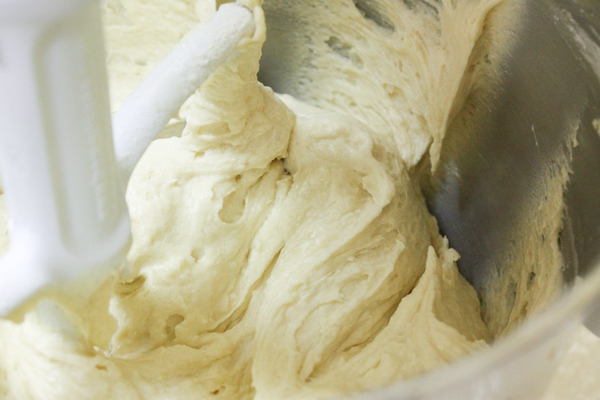 Add eggs one at a time, mixing each thoroughly into batter before adding the next. Add vanilla, then buttermilk in thirds, mixing well in between and scraping the bowl occasionally. With mixer stopped, add the flour mixture all at once and mix at lowest speed just until incorporated. Scrape the sides of the bowl and mix for 15 seconds longer. Spoon the batter into the prepared pan and smooth the top with an offset spatula. Lift up the pan with the batter, and let it drop onto the counter top to burst any air bubbles, allowing the batter to settle. Bake 20-25 minutes or until the cake is a medium brown on top and springs back when touched in the center. 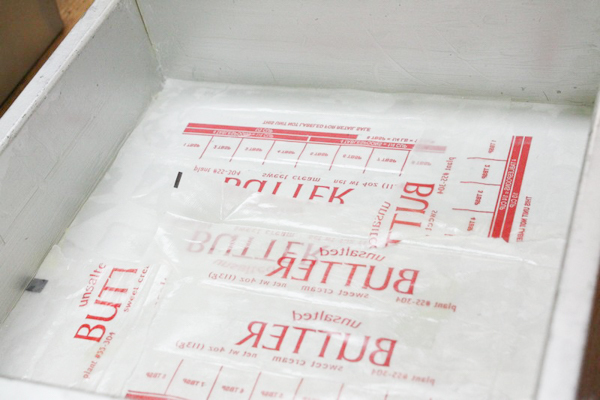 Cool for 10 minutes in pan, then turn out of pan, wrap in Saran wrap, and place in fridge or freezer until ready to ice. 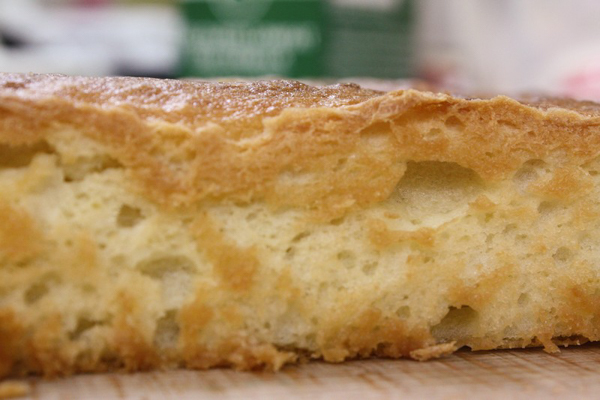 This cake bakes up tall and has a little more spongy structure than cake containing wheat flour. I also baked a lemon version in which I added 2 Tablespoons of fresh lemon juice and 1/3 cup of Lemon curd to the creamed butter and sugar. I used whole milk instead of buttermilk , then I mixed in by hand the zest of 2 lemons at the very end before spreading in the pans. 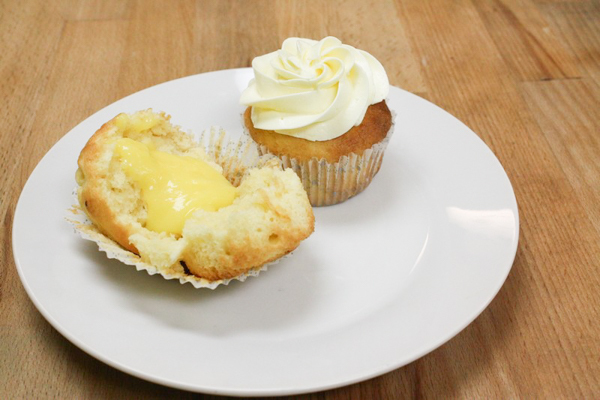 Here’s the cupcake version with lemon curd from scratch and lemon Italian meringue buttercream. Here’s a secret, Friends: You can convert almost any great scratch recipe to a gluten free recipe by replacing the cake flour or all purpose flour with a ratio of 2 parts Thai rice flour to 1 part Potato Starch and adding 2 teaspoons of Xanthan Gum. You could even make your own baking mix by combining 2 pounds rice flour, 1 pound potato starch and 3 Tablespoons of Xanthan gum. This could be substituted directly for wheat flour. Two rules: The original recipe must result in an excellent tasting cake, and NO substituting any of the other yummy ingredients! Let me know in the comments how this recipe turns out for you, or if you’ve had success baking Gluten Free recipes yourself.